Born in La Habra, California, Oshiyama, a first-generation Japanese American, spent his early years working in farming with his father. Following World War II, he took up residence in Pasadena and, in 1951, began work as a gardener. Seeking to expand his business, he took extension courses in landscaping at the University of California, Los Angeles and obtained his landscape contractor’s license in 1958. During the course of his 45-year career, Oshiyama planned and installed a wide variety of public and private landscapes in the greater Los Angeles area. A practicing Zen Buddhist, his landscapes were influenced by Buddhist philosophy and ancient principles of Japanese garden design. He collaborated with the architectural firm Buff & Hensman for over forty years, a partnership that would produce some of his most significant works. He designed landscapes for the firm’s residential projects in Pasadena, often maintaining the gardens for years after their installation, making sensitive alterations to the evolving landscapes. Notable projects with the firm include two personal residences for architect Conrad Buff as well as the Norton and King Residences. Born in La Habra, California, to Japanese parents, Hideo “Howard” Oshiyama spent his early years working in farming with his father. While he disliked agricultural work, he enjoyed the concept of working with the land. After spending the years during World War II in Ogden, Utah, he returned to Southern California and took up residence in Pasadena, where he continued to live throughout his life. Following the war, Japanese Americans encountered widespread discrimination that made it difficult to find meaningful employment. Although Oshiyama had been educated in both Japan and the United States, he experienced the same challenges in finding work. In 1951, he went to work as a gardener to support his young family. Gardening and yard maintenance provided many Japanese with stable and relatively lucrative employment during the postwar era, but Oshiyama grew frustrated with the tedious nature of the work and decided to expand his business. He began taking extension courses in landscaping at the University of California, Los Angeles and obtained his landscape contractor’s license in 1958. 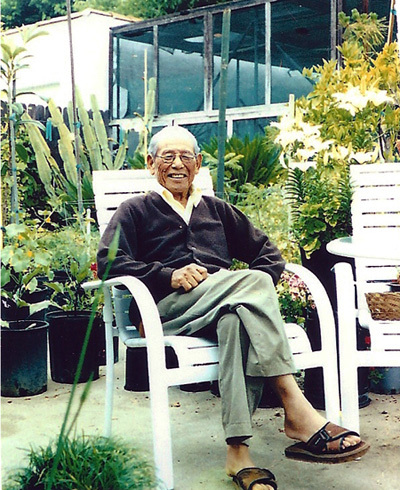 Throughout his 45-year career as a contractor, Oshiyama planned and installed a wide variety of landscapes and gardens in both Pasadena and the greater Los Angeles area. A practicing Zen Buddhist, he had spent time in Japan during his youth and his work was profoundly influenced by Buddhist philosophies and the planning principles of ancient Japanese gardens, which sought balance and harmony within the overall surroundings. Buddhism emphasizes the idea of enlightenment through contemplation of the natural landscape, and he often utilized the specific placement of plantings, rocks, and other features to “slow down the eye” and invite contemplation of individual landscape elements. Faced with a relative lack of design resources and formal training, he sought inspiration in calendars distributed by area nurseries depicting Japanese gardens made from regionally available resources. Oshiyama’s simplistic designs complemented the evolving architectural trends of Southern California in the 1950s and 1960s, which called for a seamless integration of indoor and outdoor living. His work garnered the attention of several notable local architects, including Conrad Buff and Donald Hensman. The firm of Buff & Hensman was founded in 1952, around the time when Oshiyama was first beginning to establish himself as a gardener, and the men became acquainted early on in their careers. Buff and Hensman were most known for their residential projects, which demonstrated a strong connection to the surrounding natural environment, and they employed Oshiyama to execute the landscape plans for their architectural designs. While Oshiyama served as a landscape contractor for other architects, his work with Buff and Hensman resulted in some of his most significant and complex landscape designs. Over the course of what would become nearly forty-years of collaboration, the three men produced some of their most important work together. One of their earliest collaborations was the Norton Residence, completed in 1955. Buff and Hensman’s trust in Oshiyama afforded him a significant amount of freedom: in many cases, he was given only a basic site plan; the interpretation of what was needed to execute the desired aesthetic was left up to him. While the total extent of their collaboration is yet to be established, at least eight projects have been definitively identified, including two personal residences for Conrad Buff as well as the Norton and King Residences, all located in Pasadena. Oshiyama continued to collaborate with Hensman following Buff’s death in 1989, and did so until Hensman’s death in 2002. 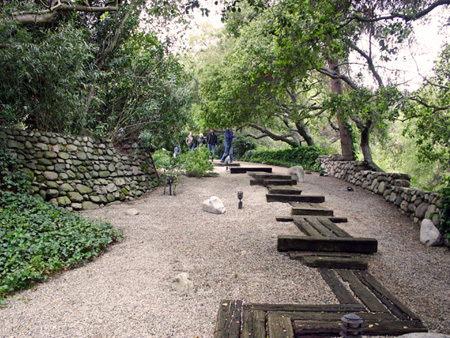 Oshiyama continued to supervise many of the gardens he originally designed for Buff and Hensman, often returning several times a year to direct sensitive additions and alterations to maintain harmony and balance in the constantly evolving landscape. In 1985, Oshiyama took his son, Tom, on as a partner and established the Oshiyama Landscape Company, which continues to maintain many of those original sites. Howard Oshiyama passed away on September 23, 2003.